American author Max Blumenthal says Trump’s UN speech was a deliberate show of contempt for multilateral institutions, adding that with his “America First” posturing, Trump is actually accelerating the decline of American empire. US President Donald Trump’s bombastic speech at the United Nations General Assembly session last week has reignited the debate over the US government’s flawed foreign policy ambitions and Trump administration’s desire to expand American hegemony. Many seasoned political observers have denounced Trump’s myopic vision and policy of bullying, especially in the context of Iran. Max Blumenthal is the founder and editor of GrayzoneProject.com. A journalist and author of several books about US and Middle East politics, he is also the producer of the recent documentary, Killing Gaza. In an interview to Tehran Times, he dissects Trump’s UN speech and says he is actually accelerating the decline of American empire and his greatest accomplishments has been surpassing George W. Bush as the most internationally ridiculed and despised American president. US President Donald Trump in his bombastic speech at the UNGA summit said he opposes globalism and multilateralism and favors patriotism. Isn’t it ironical that he said this on the podium of the UN? 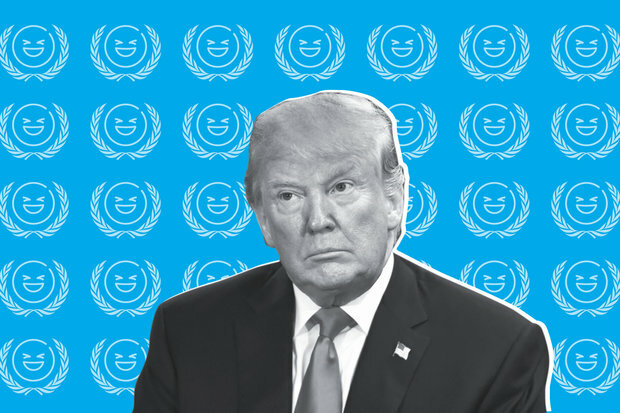 Trump’s speech was a deliberate show of contempt for multilateral institutions like the UN and the International Criminal Court. What was ironic about his speech, and about his administration’s policies, is that these institutions have been molded over the years into tools of American global influence. So with his “America First” posturing, Trump is actually accelerating the decline of American empire. Trump said his government has accomplished more in two years than governments before him did, which drew scornful laughter. Do you also think he has become a laughing stock with his bluster? Among Trump’s greatest accomplishments has been surpassing George W. Bush as the most internationally ridiculed and despised American president. This is quite a feat considering Trump has not yet initiated a catastrophic war as Bush did. He attacked Iran and China while lavishing praise on Saudi Arabia for ‘pursuing bold new reforms’ and Israel for being a ‘thriving democracy’. What makes Saudi Arabia and Israel so important for the US? Trump’s approach to foreign policy, and to politics in general, is largely transactional. His entire policy towards the Middle East — and particularly to Iran and the Palestinians — is shaped by his relationship with Likudnik billionaires like Sheldon Adelson, who contributed hundreds of millions to his campaign and those of his allies. Then there are the Saudis and Emiratis, whose sovereign wealth funds Trump and his family hope to benefit from, and who have captured the administration through a massive network of lobbyists and glad-handlers. He said the Persian Gulf countries (UAE, Saudi Arabia, and Qatar) are working with the US to ‘fight terrorism and extremism’ in their own region, and are ‘pursuing multiple avenues to end Yemen war’. Are they actually trying to end the war in Yemen or making it worse? Trump’s foreign policy advisors have adopted the viewpoint of their [Persian] Gulf whisperer, UAE ambassador Yousef Otaiba, and therefore incorrectly view the war in Yemen as a proxy war between the [P]GCC and Iran. In their minds, humanitarian concerns are secondary at best; all that matters is crushing the Houthis, whom they wrongly view as a cat’s paw for Iran. He once again slammed the International Criminal Court and UN Human Rights Council. Why is he so afraid of them? Trump is not necessarily afraid of these groups, nor does any American former or current official fear being prosecuted at the ICC. Trump’s domestic political base, and specifically the evangelical Christian right-wing, literally views these organizations as vehicles of the Anti-Christ that will impose a “globalist” agenda on traditional Americans. By singling them out for scorn, Trump is scoring points with the most powerful grassroots constituency of the Republican Party. He said the ISIS fighters were driven out from the territories they once held in Iraq and Syria by the US and its allies. How would you react to that? Obviously ISIS and its takfiri offshoots would not have been defeated in Syria without Iran, Russia and Hezbollah, as well as the Syrian army. In Iraq, it was the PMU’s who sacrificed the most to retake Fallujah and Mosul. But I would never expect an American president to acknowledge these inconvenient facts. What is interesting, however, is the refusal of many in the Pentagon to acknowledge that ISIS has been defeated at all. The generals are indeed worried by declaring victory, they will not be able to justify the permanent presence of US troops in Syria. And so they continually complain about “residual pockets” of ISIS while attempting to shift the focus onto Iran’s presence in the area. Trump also spoke about tariffs on another $200 billion in Chinese-made goods. How do you see this escalating trade war between US and China? What will be its impact? The trade war has become an election season issue in the US, and an unwelcome one for Trump’s allies in Congress, as thousands of American jobs are evaporating, specifically among agricultural exporters, as a result of higher tariffs. But for the Trump administration, restoring American jobs may not be the goal here. Trump didn’t mention Afghanistan in his speech where the war has entered 17th year without any results. Civilian casualties are at a record high and insurgents are stronger than ever before. What has been America’s legacy in Afghanistan? Through its utterly catastrophic adventure in Afghanistan, Washington has normalized the concept of permanent warfare. There have been many, many losers in this conflict, especially among the Afghan people. But there have been many winners as well, from the Afghan puppet leaders and warlords who have shipped billions in US contract money and opium profits to Swiss banks, to the US military industrial complex, which tested the over-priced and essentially useless F-35 aircraft in Afghanistan this week. From a military standpoint, the US has lost the war, but elites from Washington to Kabul have benefited handsomely in the process.